"When this thing sweeps over you, it's going to feel like the end of the world." Sony has debuted a second trailer for the film Only the Brave, telling the true story of the Granite Mountain Hotshots firefighters. 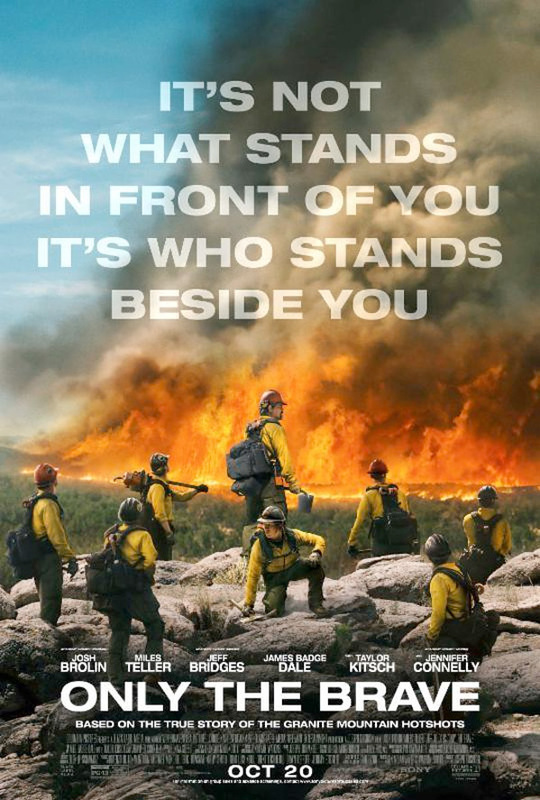 Directed by Tron Legacy's Joe Kosinski, Only the Brave is about an elite crew of firemen from Prescott, Arizona who battled a wildfire in Yarnell, AZ in June of 2013 that claimed the lives of 19 of their members. The huge cast includes Josh Brolin, Miles Teller, Jeff Bridges, James Badge Dale, Geoff Stults, Andie MacDowell, Ben Hardy, Taylor Kitsch, and Jennifer Connelly. This was titled Granite Mountain Hotshots before being changed to Only the Brave. With so many more dangerous wildfires ablaze right now, I'm not sure if this is good timing or bad timing, but it does seem like this has a positive message. You can still watch the first official trailer for Only the Brave here, to see more footage from this film.